The Body Rider 3-in-1 Trio Trainer is an impressive multi-machine! It's not only an elliptical, but is also a recumbent bike and an upright bike. Its resistance can be adjusted magnetically, making it easy for you to get the workout you want. This impressive exercise machine has an array of features including a heart rate monitor, 21 training programs, and even a seat with an adjustable backrest. The Body Rider isn’t just sturdy with it’s steel frame, but it is also built for comfort. The saddle seat features a thick foam padding that will ensure a comfortable workout for every user. Also, you have the added benefit of a firm yet comfortable backrest that provides you with support during the duration of your exercise session. As for the pedals, users will be glad to learn that they’re wide enough to fit comfortably around every shoe size, and come with firm straps to secure your ankles and prevent your feet from slipping. Similarly, the armrests are designed to ensure a slip-free workout. The assembly process is easy and straightforward, especially with the illustrated instruction manual. Most users claimed that it took them singularly around 2 to 3 hours to assemble the machine. It is important to note that you will receive several types of tools, screws, bolts and accessories to help you assemble your Body Rider. However, lubricant will not be included. As with many of these machines, the heart rate monitor is built into the console and relies on information that is relayed by the pulse rate sensors on the grips of the handles. In order to use them correctly, be sure to grip the handles firmly and have your palm and fingers on the sensors. However, it is often considered that these types of heart rate monitors are inaccurate. The machine features an LCD monitor and console that is easily programmable. It features 21 training programs, and tracks your heart rate, the number of calories you’ve burned, elapsed time, and the distance you’ve traveled. The monitor isn’t back lit, and is admittedly small. The Body Rider features 21 different training programs, giving you plenty of options to find the perfect exercise program for your particular needs. 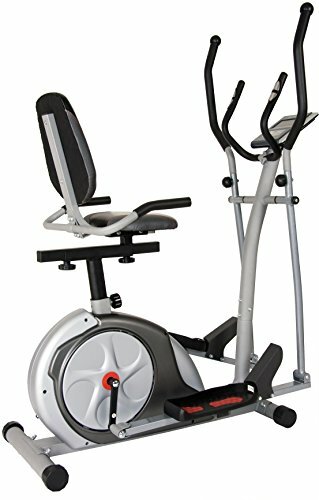 The Body Rider 3 in 1 elliptical (AKA BRT3980) has a one year limited warranty on the frame, and a 90 day warranty on parts. Admittedly, this is an unimpressive warranty for this price range. Body Rider 3-in-1 Trio-Trainer, Silver/ Red, Hupa International, Inc.